With another recent report warning against potential eardrum damage from high volume levels generated by iPod headphones, is the era of earphones over? Challenging headphone’s dominance within the personal listening market is the Sound Asleep pillow, a safer yet equally superior replacement to earphones. your loved ones awake and also damaging your ears. 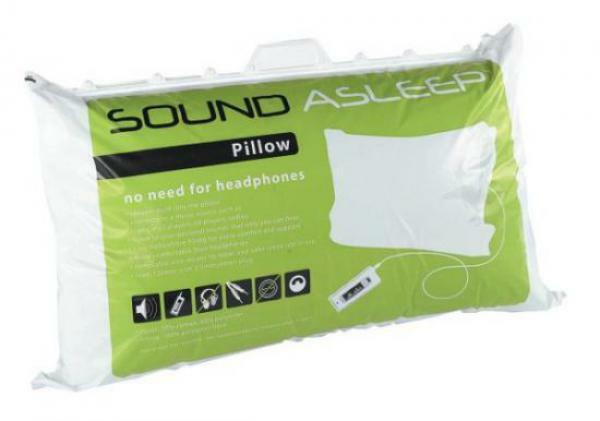 The unique Sound Asleep pillow has a discreet speaker built into its design meaning the sound is distributed via the cushioning, direct into the users ear. Compatible with iPods, MP3 players, televisions and radio, the Sound Asleep enables the user to listen to their own personal sounds that only they can hear, without the discomfort or risk of headphones. The pillow has a removable 120mm wire meaning it is safe and tidy when not in use and the connector uses a 3.5mm stereo plug, universal to most devices. With 100% polyester cosy hollowfibre filling it’s allergy free and exceptionally comfortable.